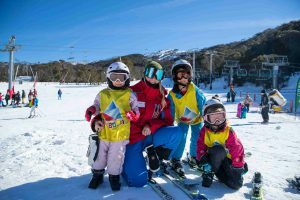 Thredboland’s Ski Program (5- 6 years) offers both full day and afternoon lessons teaching the basics of skiing and how to have fun exploring the mountain. This provides plenty of one on one attention so they can learn at a faster rate. The day not only consists of ski lessons but also includes meals and incorporates fun themes and activities for the kids to enjoy both indoors and on the snow. Stand-alone program excludes equipment rental. Pick up from 3:30pm-3:45pm outside Thredboland.